Epson Philippines Corporation (EPC) is inviting the public to “think smart” and share their ingenious tips for a chance to win exciting prizes. Epson recently launched the Think: TANK! contest through its Facebook page (facebook.com/EpsonPhilippines). 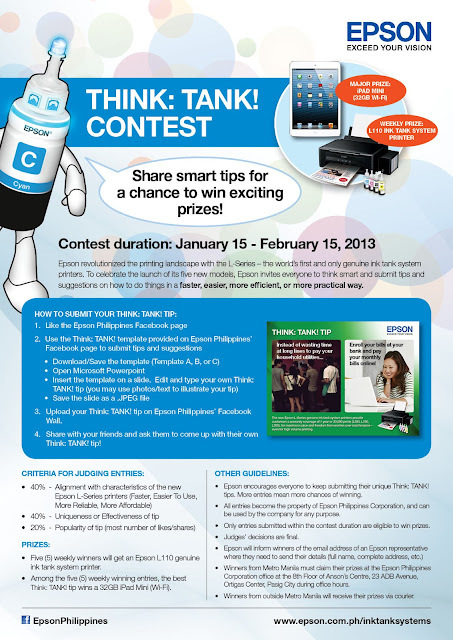 The contest invites Epson Facebook followers to submit Think: TANK! tips that focus on how to do things faster, easier, more efficient, or in a more practical way. “Since Epson is all about providing energy-saving, high precision technologies through products that exceed the expectations of our customers, we wanted a fun and interesting contest that reflects the Epson way of thinking: smart, efficient, and always seeking improvement,” says Donna V. Ferro, Epson GM for Marketing Communications and PR. The public can visit Epson Philippines’ Facebook page and download the templates provided in order to join the contest. Each week, the person who submits the best Think: TANK! tip will win an Epson L110 ink tank system printer. At the end of the contest, the best tip among the five weekly winners will win an iPad Mini (32GB, wi-fi). “We believe Filipinos are especially talented in finding ways how to make things easier, faster, or more economical – we’re street smart. And since this is a contest on a social media platform, the popularity of the tip – most likes or most shares – would also be part of the criteria,” added Ferro. The title of the contest alludes to Epson’s current flagship inkjet printer line – the new L-Series genuine ink tank system printers. Epson’s first-in-the-world product has changed the landscape of high-volume printing in the Philippines by providing the lowest possible cost to the end-user. The new L-Series printers offer an incredible value at PhP295 per bottle with a yield of 4,000 pages (black). With such affordable consumables (inks), customers can use genuine Epson inks and enjoy exceptionally high-quality prints without worrying about costs.